Clean Mats in Your Car or Truck Keep the Interior Smelling and Looking Good. Clean Mats mean a Happy Car or Truck! It also means your feet will be dry and clean, not to mention the improvement you'll see in the cleanliness and neatness of the rest of your vehicles interior. Just a tip to start with - don't try to clean your car mats in the washer. You'll probably damage the mats and your washer might protest also. Oh, and remember to wash the back of your mats! When you need more than a trashcan, detergent and hose!!! How to Clean Mats for Your Car or Truck : Here's a generic recipe for cleaning both rubber and carpeted car and truck floor mats. You'll need a large, clean outdoor trashcan or a utility sink large enough to easily hold your car mats. You'll also need your favorite laundry detergent. Remove your car mats one or two at a time, hose them off and place in the trashcan or sink. Fill the trashcan or sink with just enough water to cover the mats and add just enough laundry detergent to barely make suds. Soak your mats for an hour or two. Use a soft bristle brush and some full strength laundry detergent to brush clean the top and bottom of your mats, making sure not to brush too hard or you might hurt the surface of your mat. Let your mats soak again for several hours then examine them. If clean, rinse and hang to dry. If not clean, repeat the above steps with a fresh change of water/detergent in your trashcan or sink. ATTENTION : Always test the detergent, soap or cleaning product you are using on an inconspicuous piece of your mat or carpeting to make sure it doesn't fade or negatively affect the mat or carpet. Rubber/Carpeted Car and Truck Mat Cleaning 1 : If you don't have a big utility sink or a clean trashcan remove the mats from your car, lay them on the driveway, hose them off and then use a soft bristle brush to clean them with a sudsy solution of laundry detergent. I use one capful of liquid laundry detergent to two gallons of warm water. Rinse the mats really good with the hose and hang to dry. If you really need some cleaning power add a couple ounces of liquid bleach - but check your mats for colorfastness before using the bleach. Rubber/Carpeted Car and Truck Mat Cleaning 2 : Take your car to the self service car wash. Remove the mats from your car or truck. Hang them on wall hangars if your car wash is so equipped. Turn on the high pressure soap and wash the mats - front and back. Turn on the high pressure water only rinse and rinse the soap out. Allow to dry before returning to your vehicle. Rubber or Vinyl, Car and Truck Mat Cleaning 1 : If my rubber or vinyl car/truck mats aren't really dirty, but still need cleaned, I use Windex Window Cleaner in the spray bottle. Spray it on, wipe it off with paper towels. Repeat if necessary. Over time this technique seems to degrade the surface of the mat but it doesclean the mat without making it slippery. Rubber or Vinyl, Car and Truck Mat Cleaning 1 : If you have really dirty rubber or vinyl floor mats in your vehicle and want to renew their original appearance as best you can, there are several products to try. First you can check out TechCare FloorLiner and FloorMat Cleaner from WeatherTech. WeatherTech also has a protectant product for your car mats and floorliners that adds a protective non-slip surface after you have cleaned the mats/liners. Second you can try out a product from Chemical Guys called the Rubber and Vinyl Floor Mat Cleaning Kit. It's the same basic idea as the WeatherTech product above. 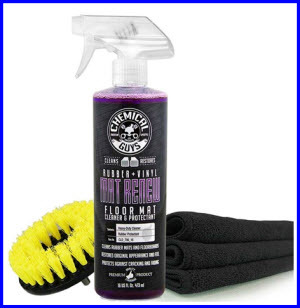 It cleans the dirt, grime and gunk off your mats and floorliners. Then you apply a protective non-slip coating. Remember, protectant products like Armor All make your mat and floorliners slippery. This could be potentially dangerous to you or your passengers. So unless your doing a practice ice skating rink in your vehicle, I suggest a WeatherTech or Chemical Guys product. Carpeted Car and Truck Mat Cleaning : You can quickly clean up spots and small dirty areas on your carpeted car or truck floor mats with Armor All Multi Purpose Auto Cleaner or similar product. But these products leave a chemical smell in your car. To get rid of this smell, wet an old bath towel, wring it out real good, and wipe the areas of the mat you just cleaned really good. Let the mat dry and then sprinkle some baking soda on the cleaned areas and gently rub it in. Vacuum the mats to remove the baking soda. TIP : If you are sensitive to cleaning solutions, soaps, detergents, etc. then try using a 3% solution of food grade hydrogen peroxide to clean your mats. TIP : To keep really bad stains and nasty stuff off your mats try using universal absorbent truck/car floor mat protectors. These mats will also prevent water and dirt buildup between your mats and carpeting. Hopefully this reduces mold and mildew odors and helps keep your shoes drier, especially if you have rubber floor mats. Caution and Remember : Always test any cleaning product or recipe on an inconspicuous piece of carpeting, floor mat or upholstery before you clean the whole thing. Always follow the manufacturers directions on application and use of the products you choose. Good Luck and Have a Clean Happy Car!